The Ballater Highland Games are held annually on the second Thursday in August in Monaltrie Park, Ballater and in 2019 the Games will be held on Thursday 8th August. There have been Games held in Ballater since 1864 and, apart from the war years, the Games have continued uninterrupted until the present day. Many famous athletes and champions have competed at Ballater. Today the events form part of the circuits comprising the Glenfiddich Heavy Events Championship and the Grampian Games Qualifying Championship, which encourages the younger athletes to participate in the heavy and field events. 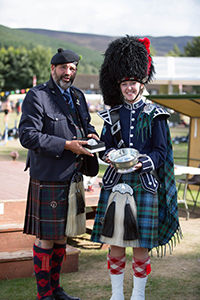 Ballater Highland Games prides itself in having something for everyone, young and old alike. On Games Day there are a number of varied trade stands, together with a funfair for the children. On occasion, personalities are to be seen, and one memorable day a military 25 pounder was fired by a certain television presenter to signal the start of the Hill Race. To complete the day, Beat Retreat by the Pipe Bands is planned for 7pm on the Church Green in Ballater.